A mid-cap food stock yielding 4.3% and a relatively stable REIT stock yielding more than 6% are worth exploring as long-term investments. There are good reasons to love dividend stocks. The most obvious one is for the passive income streams they generate, or for those of you who reinvest your dividends, for the fact that they enable you to increase the number of stock shares you own. Moreover, studies have shown that in general, dividend payers outperform non-dividend payers over the long term. If you're interested in relatively high-yielding dividend stocks that have outperformed the market over the long term and don't have tons of risk like many higher-yielders, you should explore B&G Foods, Inc. (NYSE:BGS) and Iron Mountain Incorporated (NYSE:IRM) B&G is the better bet for investors most concerned with total capital appreciation, while Iron Mountain is the better choice for investors most concerned with current income. Both are suitable for investors with moderately high risk tolerances. B&G Foods produces and sells branded shelf-stable foods that it distributes via various channels in the U.S., Canada, and Puerto Rico. The Parsippany, NJ-based company's growth strategy largely involves acquiring nostalgic food brands that are expected to be immediately or very soon thereafter accretive to its earnings and cash flow. "Ho, ho, ho, Green Giant." Image source: B&G Foods. Many of B&G Foods' brands are well-known names, such as Cream of Wheat (hot cereals), Maple Grove Farms (syrups), and Ortega (Mexican food). In November 2015, the company added the iconic Green Giant brand along with the Le Suer brand to its portfolio via its largest acquisition to date. It bought these leading frozen and canned vegetables brands from General Mills for $765 million in cash plus an inventory adjustment at closing of approximately $58 million. Last November, B&G made its second largest acquisition ever when it bought the spices and seasonings business of ACH Food Companies for $365 million, which brought it the Spice Islands, Tone's, and Durkee brands. 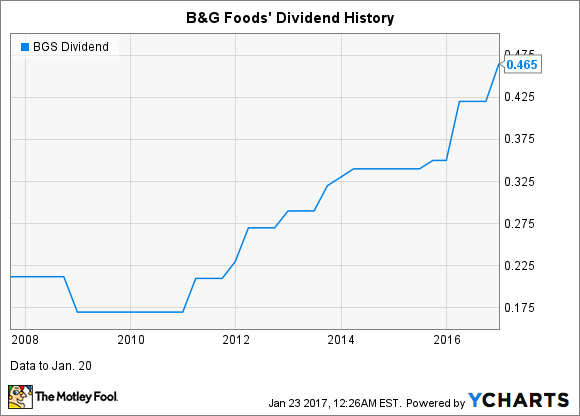 B&G recently hiked its dividend, which is currently yielding 4.3%, by 10.3%. The company's cash dividend payout ratio (dividends paid divided by free cash flow) is 45.7%; while many factors are at play, a payout ratio of about 65% or less generally suggests that a company can comfortably afford its dividend and investors are likely to get future dividend hikes. The company has paid a dividend each quarter since its 2007 IPO. While its overall dividend history is attractive, its dividend increases are more erratic than those of some companies. In the first nine months of 2016, B&G's sales jumped 56.7%, thanks largely to its Green Giant acquisition, with this brand contributing 40% of total revenue. Earnings per share rose 49.5%, while adjusted EPS soared 61.3%. Like most companies, B&G is not without some challenges. They are relatively moderate and likely to be overcome, in my view, but investors need to monitor them. Sales in the company's "base business" (businesses owned for at least one year) declined 2.3% in the first nine months of 2016. Rather than this being solely a case of its brands simply falling out of favor, there were two "explainable" reasons that, combined, accounted for 71% of the total decline. A significant sales decline in B&G's TrueNorth snack food brand accounted for nearly 40% of the total decline. The company raised prices of the products within this line that contain almonds because of the big spike in almond prices in 2015 caused by the California drought. These increases negatively impacted consumer demand. When it reported its Q3 results, the company had recently begun rolling back prices as almond prices had begun to return to historical norms, but consumer demand had not returned to prior levels. A drop in sales of the company's aggregate syrup brands accounted for about 31% of the total sales decline. This decline was primarily due to maple syrup price deflation due to the strength of the U.S. dollar relative to the Canadian dollar, which has resulted in increased competition in the maple syrup category. B&G is leveraged up -- its debt-to-equity ratio is 192%. This isn't overly concerning because of the company's strong cash flow history and the historically low interest rate environment. Even if the Federal Reserve hikes rates several more times this year, rates will still be near historic lows, assuming increases are modest. However, the high leverage is something investors need to be aware of. 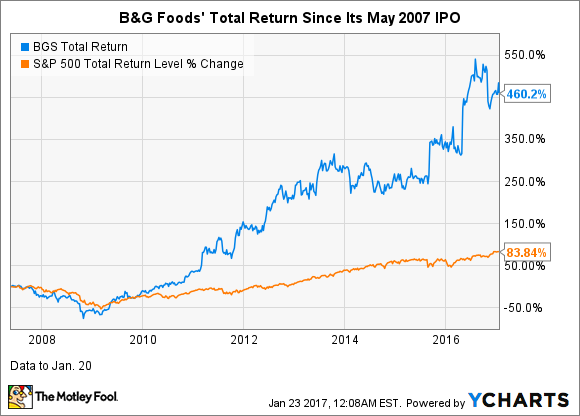 B&G Foods has good growth potential as it's still only a relatively small company, with a market cap of $2.9 billion, and there are plenty of potential acquisition candidates. Analysts expect B&G to grow earnings per share 41.8% in 2016 (Q4 hasn't been reported yet) and an average of 17.9% over the next five years. The long-term growth projection could prove conservative, as B&G regularly beats analysts' estimates. Iron Mountain's core business is providing storage -- primarily of records -- and information management services for companies and government organizations. It's also been expanding into what it terms "adjacent" (related) operations, including data centers. The Boston-based company, which is the leader in its industry, has a portfolio consisting of about 1,500 facilities spanning 45 countries. It has more than 220,000 customers, including about 94% of the Fortune 1000 companies. Iron Mountain has been in business since 1951 and a publicly traded company since 1996. In 2014, the company converted to a real estate investment trust (REIT). REITS are among the highest-yielding dividend stocks because companies organized as REITs are required to pay out at least 90% of their income as dividends due to their preferential tax treatment. REIT stocks in general have had nice price run-ups in recent years, thanks largely to the historically low interest rate environment. In mid-2016, though, much of the group began pulling back -- some significantly -- because of the expected modest rise in interest rates. In addition to December's rate hike, the Federal Reserve is widely expected to raise rates several more times this year. This doesn't mean investors should abandon REITs, but it does mean investors should have a long-term investing horizon and should focus on high-quality, best-in-class REITs. Key attractive features of Iron Mountain's business include relatively low maintenance costs, customer diversification, and stability. No single customer accounts for more than 1% of its revenue. Once customers store their initial records and/or other property with Iron Mountain, they tend to keep them with the company for the long haul. 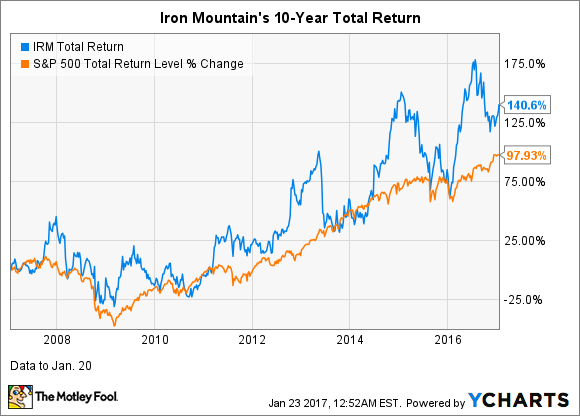 Moreover, at least the core storage portion of Iron Mountain's business is insulated from economic downturns. Based on the continued demonstration of growth and durability of cash flows, Iron Mountain increased its quarterly dividend by 13% for the fourth quarter. The company has a rather brief history as an REIT, but it has solidly increased its dividend in this time period. 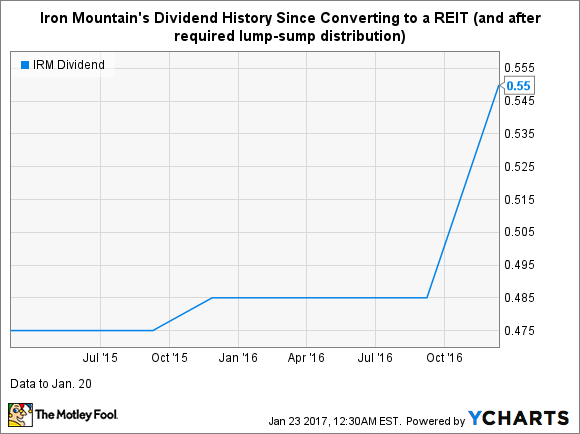 Because Iron Mountain converted to an REIT in 2014, it was required to pay a lump-sum distribution at the end of that year. That payment skews the dividend history, so the following chart shows from 2015 on. For the first nine months of 2016, Iron Mountain's revenue increased 26.2% as reported and 27.4% in constant currency, driven by a large acquisition (Recall) in May. However, normalized funds from operations (FFO) per share -- a key metric for REITs, which is akin to earnings per share for this class of business -- declined 20%. This was largely related to the Recall acquisition. As this acquisition is further integrated, the company expects to realize increased synergies, so FFO should improve. There's no guarantee, of course, and investors should monitor this situation going forward.